As you'll see below, I kept it pretty simple on this one. My green of choice was celery...an intriguing component for being at the forefront of a cocktail, but the first thought that came to mind upon reading the theme was celery bitters. 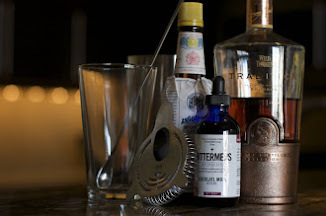 I followed this and came up with a slightly bitter/aromatic savory cocktail using celery infused vodka, Dolin dry vermouth, Cynar, and, of course, celery bitters. Combine all ingredients to mixing glass with ice and stir until well chilled. 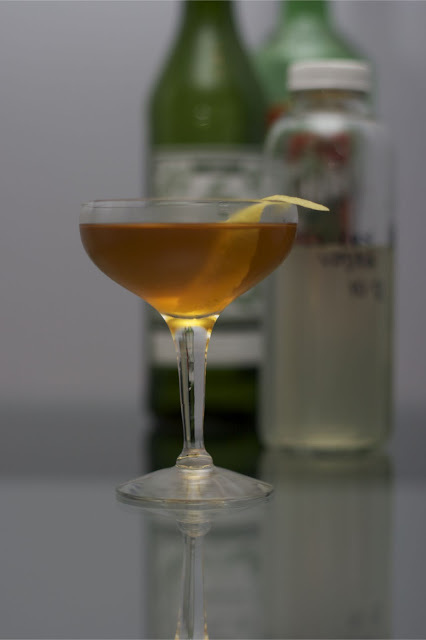 Strain into a cocktail coupe and garnish with lemon zest twist. Combed ingredients in glass jar and store in the fridge 2-3 days, shaking twice daily. Strain/squeez thru cheesecloth into a fresh bottle and refrigerate. And with this last 'summery' theme of (it's not easy) "Bein' Green" we may well march forward into the fall and winter months with at least one more round of cocktails that remind us of the warmer days gone by. Thanks once again to Ed over at Wordsmithing Pantagruel for another great theme and be sure to check back for the MxMo round up post to see everybody's green contributions. Celery my old nemesis. But I imagine it pairs quite well the cynar.